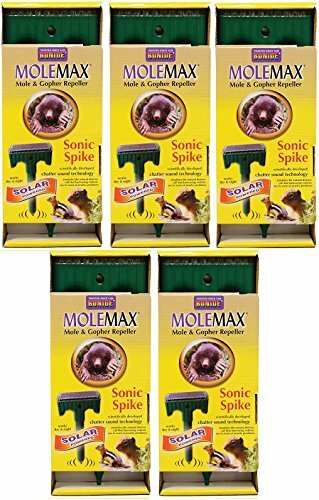 (5) ea Bonide 61119 MoleMax Mole & Gopher Sonic Repellent Spikes / Stakes Molemax Mole Repellent Stakes, Solar Powered, Uses Chatter Technology To Mimic The Alarm Sound Made By Moles & Other Burrowing Animals When Predators Are Present, Solar Cell Installs Flush With Soil Surface To Protect From Mowing Damage, Charges During Sunlight Hours & Can Work For Days On A Single Charge, Will Not Harm Animals, Sonic Repeller Works Year Round. If you have any questions about this product by MoleMax, contact us by completing and submitting the form below. If you are looking for a specif part number, please include it with your message.